Join the shopping craze with 6 beautiful girls of different races! 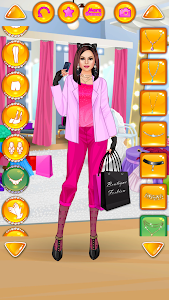 This dress-up app offers about 200 virtual apparel items, hairstyles and accessories to try out. Put together new looks for the dolls: glam, trendy, classy, traditional, fancy, casual or other. These gorgeous women are fabulously rich and don't have to worry about maxing out their credit cards! With their great sense of fashion and style, these fashionistas pick the best places to shop and the most expensive beauty salon to do their hairstyle at. 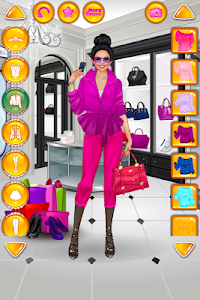 Unlike most other fashionista games out there, there are no in-app purchases, and you can't spend any real money here. It's a truly free dressup game. That's also true for all our other makeover / cosplay apps. Just follow the "More by Games For Girls" link to our new styling games. Train your skills and tastes as an outfit designer. Learn to express yourself and show other people your inner personality and uniqueness with the way you look. If you're more into youth's urban clothing, be sure to check "College Student", "High School". For more glamor stuff, models and celebrities, download "Beauty Queen", "Prom Night" and "Model Wedding". Unleash your inner shopaholic and imagine you are a top super model or a celebrity (famous actress, movie superstar, pop icon, or a reality show star)! Try various outfits and makeovers with each glamour doll. Similar to "Rich Girl Crazy Shopping - Fashion Game"